We're officially on the Titus Canyon leg of our larger Death Valley trip—a round trip odyssey that will take us to and near a number of places. This section of our journey began with the last post, which was centered around Beatty. I’ll be complementing my February photographs with photos from a similar journey MOH and I took back in the late spring of 2009. So, let's get on with it! We'll begin by leaving Beatty. There are two ways to get to the Titus Canyon road from Beatty. I usually forget that fact because it's generally been years between journeys into the canyon. Consequently, I seem to end up on this route one time, and that route the next time, alternating routes without really thinking about it. 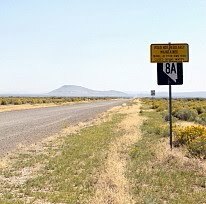 Then I wonder why the road, the signs, and the overall lay of the land don't look the same as the last time I passed through the area. Beatty's main intersection: a 4-way stop. 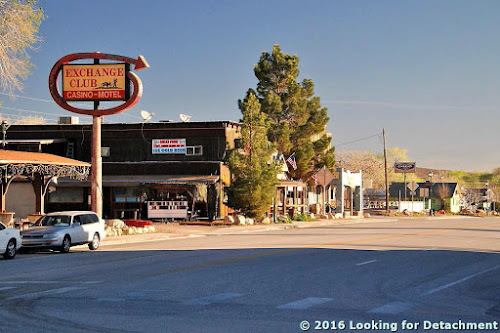 We went one way in 2009, turning left at Beatty’s main intersection, which kept us on U.S. 95 as we drove east and then south through and out of town. 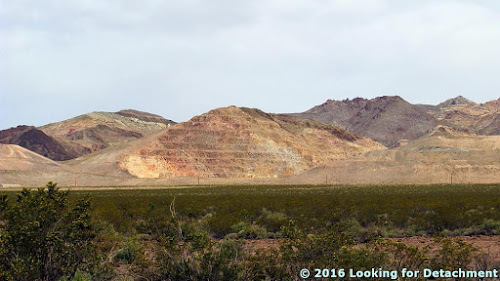 We passed the dirt turnoff to Fluorspar Canyon (might there be some fluorite up there?) 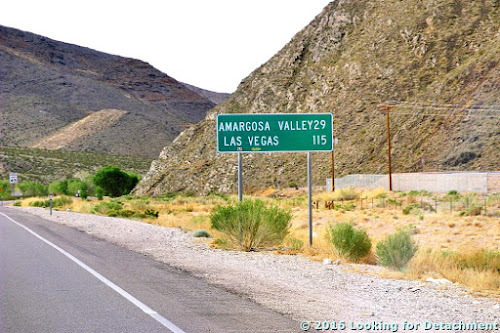 and passed into the Amargosa Narrows. 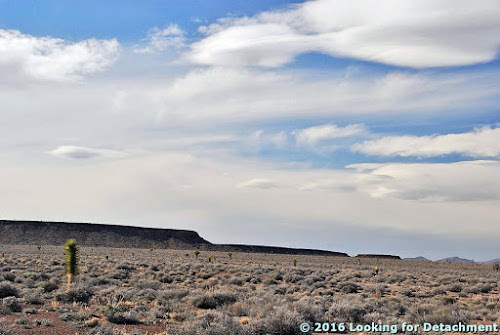 Not far beyond the Narrows, we turned right onto the unsigned paved road to the Beatty Airport, which goes by an obscure ghost town, Gold Center. Airport Road turns to dirt beyond the airport. 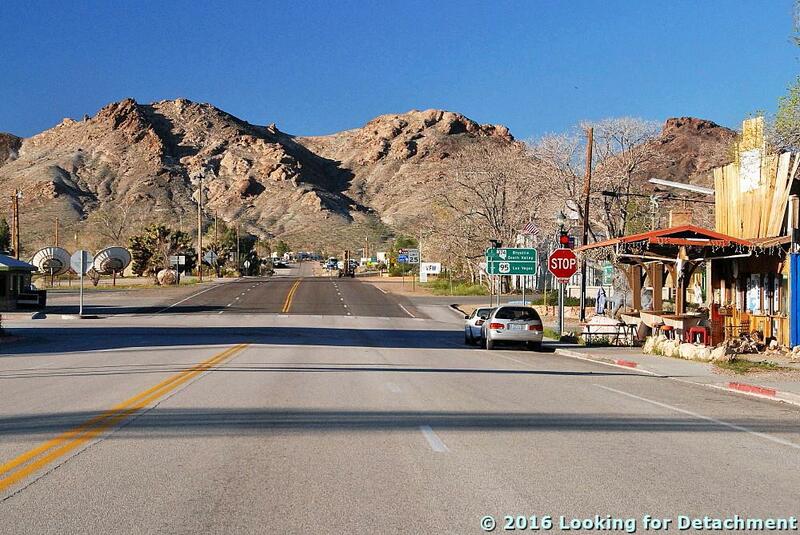 The Amargosa Narrows: Precambrian Z rocks crop out on the right, left, and straight ahead. 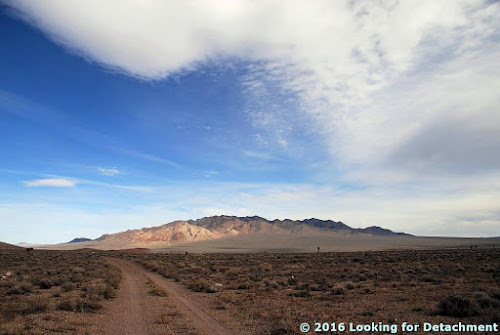 We went the other way this past February, going straight on Nevada S.R. 374, the Daylight Pass road, at the same intersection. This paved road winds through a bit of the Bullfrog Hills, going by Velvet Peak and Paradise Mountain. It then meets up with Airport Road near the Bullfrog pit of the currently inactive Bullfrog open pit gold mine. The Bullfrog pit, as seen from the dirt portion of Airport Road, looking across a sea of blooming creosote (from the early May trip, 2009). The Bullfrog gold mine—AKA the Barrick Bullfrog gold mine—was in operation from 1988 or '89 through 1998, when it produced about 2.4 million ounces of gold from two main open pits, the Bullfrog pit and the Montgomery-Shoshone pit, and from at least one related underground project, the North Extension. 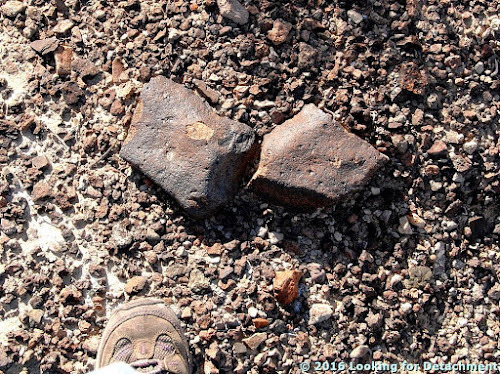 Discovery of these ore deposits began in 1982 with St. Joe Minerals Corporation (overall history is described in some detail here, here, and here). The exploration property then passed through several companies in quick succession through a series of acquisitions or buyouts, going from St. Joe to Bond Gold Corporation, then to Lac Minerals Ltd (or LAC Minerals Ltd, depending on the year—this company went back and forth with its name several times in a few years), and then to Barrick Gold Corporation. The deposit is hosted in Tertiary volcanic rocks, mostly ash-flow tuffs that are cited by Castor et al (1989) as being correlative with the Miocene Timber Mountain Tuff, which has age dates ranging from about 10 to about 15 Ma (Geolex). In fact, the host formation was mapped by Maldonado et al (1990) as the Rainier Mesa Member of the Timber Mountain Tuff. The deposit formed near the end of an extreme extensional event that took place in the area between 11.4 and 7.6 Ma (Castor and Weiss, 1992; Weiss et al, 1995; Castor et al, 1999). 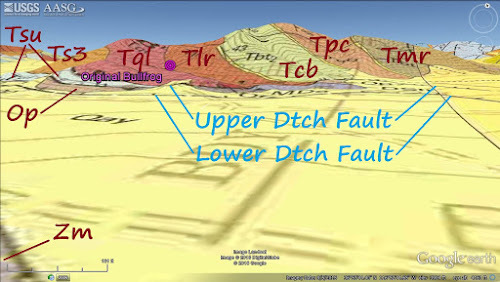 Although ore is partly hosted in and controlled by structures in the upper plate of the Bullfrog Hills detachment fault, it's not generally considered to be a detachment-related type of ore deposit (although knowledge of detachment faulting and related structural models would be indespensible for making discoveries in the Bullfrog mining district). A little farther down the Daylight Pass Road, about six miles from the center of Beatty, the Titus Canyon dirt road heads WSW toward the Grapevine Mountains. Turnoff to the Titus Canyon road. The Titus Canyon road is a dirt road of variable character, narrow and washboardy in many parts, and entirely one way east to west. It isn't possible to turn around once you get going, and from asphalt to about "Tan Mountain," there are few pullouts. It's possible that one could exit the road in two or more places within this first section, but it's not clear to me that any of these possible exits are really roads. High clearance 4x4 vehicles are recommended! Although 4WD is not usually necessary along most sections of the road, high clearance is a must, and 4WD can become necessary at any time (especially during bad weather). I think the road is blocked from the east when bad T-storms or flash flooding are expected, but I'd always want to check the weather to avoid getting stranded during a bad washout, like the kind the Death Valley area experienced in October, 2015. Don't get caught up in one of these! Somewhere between the Titus Canyon warning sign and the Death Valley sign, you can look off to the north and see some classic Nevada ash-flow tuff formations, in this case tilted moderately along two detachment faults. The visible roads and workings are in the area of the Original Bullfrog mine, a little less than four miles west, as the crow flies, from the Bullfrog open pit. Tilted volcanic rocks on Bullfrog Mountain (the highest point in the photo), with the Original Bullfrog mine not far left of center. Wildflowers and creosote are in bloom in this May, 2009 photo. More precise photo and location information can be had by perusing the map near the end of this post. 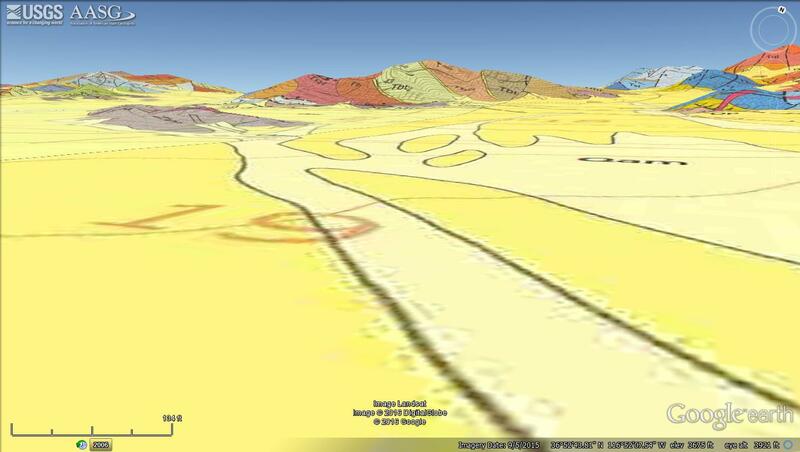 I got to fooling around, saving this Google Earth image of Bullfrog Mountain from a similar angle as my photo above. 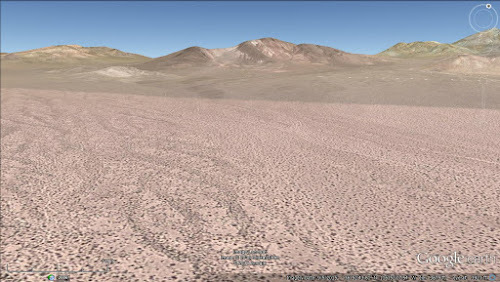 Google Earth image of Bullfrog Mountain. Then I fiddled a little more and shortly had a geologic map overlay of Bullfrog Mountain. The two USGS maps used here are the Geologic map of the northeast quarter of the Bullfrog 15-minute quadrangle (Maldonado et al, 1990) and the Geologic map of the northwest quarter of the Bullfrog 15-minute quadrangle (Maldonado, 1990). 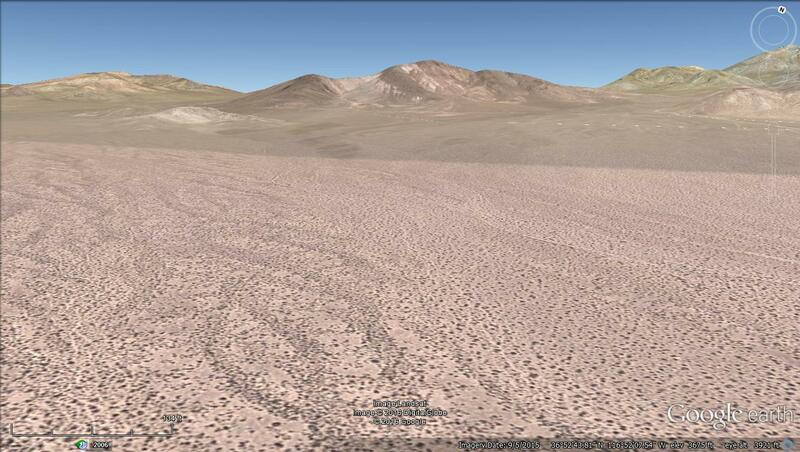 The same Google Earth image with two kmz file overlays. What fun! Okay, this was so much fun, I went ahead and made the image match my photo more precisely, and then added a few geologic labels. The photo, again, for comparison with the image below. 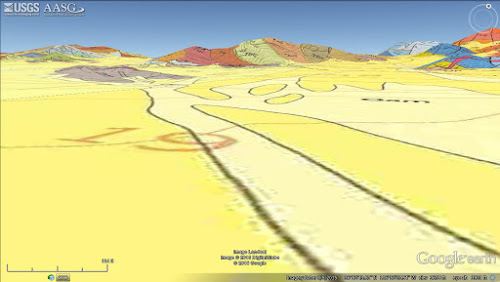 Geologic overlay of Google Earth (G.E.) image, labeled. This is a good part of the Bullfrog Hills in which to see the results of the extreme extension that occurred in the area during the Miocene, although I'm not sure if its possible to actually place a finger on the main (or secondary) detachment surface. For the most part, the detachment faults are shown on the maps as dashed beneath Quaternary cover. In only three areas is either detachment fault mapped in the hills where we might be able to go look at the fault planes, and in only two places are dip measurement shown, and both sites are in the low hills to the east of the photo and images. As for the rest of the local geology, the mylonitized lower plate Precambrian rocks are easily reconnoitered in the light colored hill on the far left of my photo (lower left of the G.E. geologic image), and the tilted volcanic section is easily walked in the hills above the Original Bullfrog mine. The main volcanic formations, oldest to youngest (west to east, left to right), are as follows: Ts3, mostly sandstone, shale, and conglomerate; Tql, quartz latite lava flows; Tlr, the Lithic Ridge Tuff; Tbt2, bedded tuff; Tcb, the Bullfrog Member of the Crater Flat Tuff; Tbt3, bedded tuff; Tpc, the Tiva Canyon Member of the Paintbrush Tuff; Tbt4, bedded tuff; and Tmr, the Rainier Mesa Member of the Timber Mountain Tuff. The Op on these maps is the Ordovician Pogonip Group, here consisting of limestone only 60m thick. The Zm consists of Late Proterozoic metamorphic rocks that have mid- to late Miocene cooling ages related to the regional extension. The lower trenches at the Original Bullfrog mine used to be a great place to stop when driving through the area. (The location dot in the last image shows the site of the original mine, not the lower trenches; the lower trenches are more easily seen in the last photo as the small color anomaly below the location of that dot.) The easily unearthed quartz-amethyst veins contain v.g. 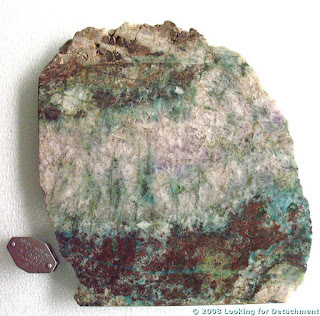 and other neat minerals (see this post and next week's post). Much of the mineralized material was mined out in the 1980s (or earlier? ), and a bunch of it was placed on a nearby heap leach pad. I doubt that leaching was an efficient way of recovering gold and silver from this ore, and we used to bemoan the placing of all this great specimen material out to leach. Not long after my first introduction to the area, which was probably in about 1986 or a little later, someone—no, I really can't won't say who—came and scraped the leach pad, removing all the rock in order to recover and melt the gold and electrum down for a wedding ring (at least that's the story I've heard). I visited the area most recently on the last day of the last millennium (depending on when we say the millenium started). I camped on one of the drill roads after wandering around the roads, trenches, and prospects. I didn't find much. If you ever happen to stop by the area, remember that you're probably on patented (private) ground, at least up near the original mine site, although I don't remember seeing any signs. 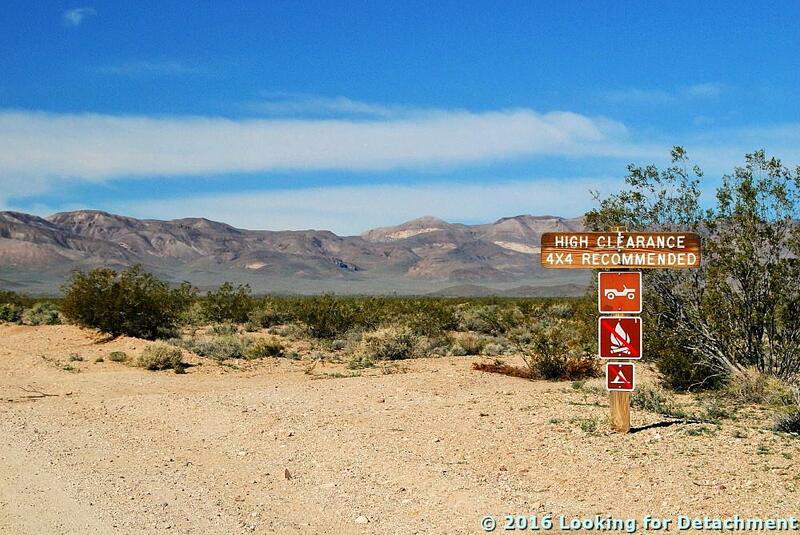 The Death Valley National Park boundary on the Titus Canyon is marked by signs, a fence, and a cattle guard. 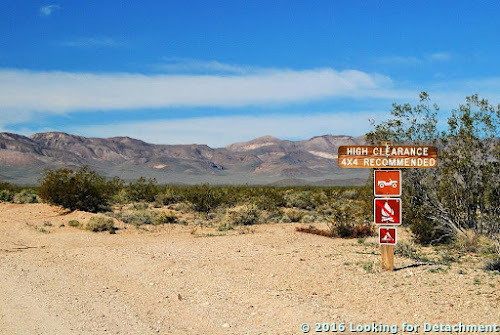 Here's where we'll stop our journey today, right at the eastern boundary of Death Valley National Park (as an oldtimer, I keep wanting to call it a National Monument). Before a mediocre breakfast with slow service at the casino at the north end of Beatty, I walked around in the early morning light taking various photos of some of the old (and old-styled) buildings. The Sourdough Saloon and Happy Burro sit across the street from the parking lot of the Exchange Club Motel. By the way, you can get a dinner at either place photographed above, and over the course of our two nights in town, MOH and I ate at both of them. Both establishments are relatively congenial. 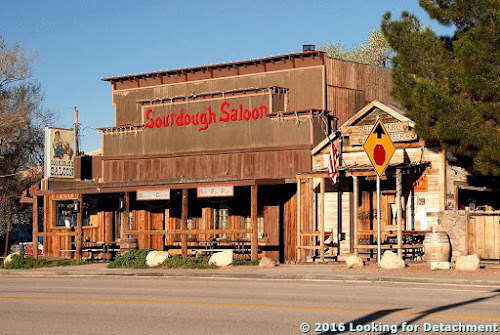 During dinner at the Sourdough Saloon the first night, we found out from other superbloom afficionados that "the best place" was down near Badwater. Additionally, the Sourdough has interesting graffiti on the ceiling: Geology, geography, and geoscience students from around the world (at least as far away as Norway) have left their mark while stopping in for burgers (or pulled pork) and beer. 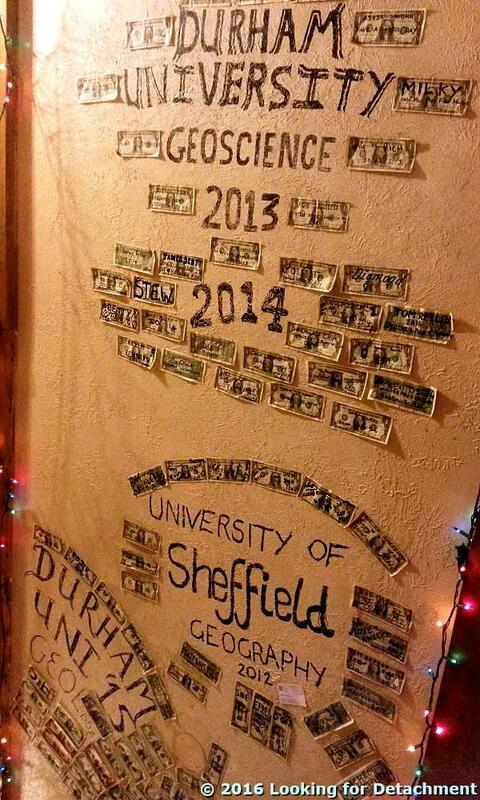 Ceiling in the dining area of the Sourdough Saloon. 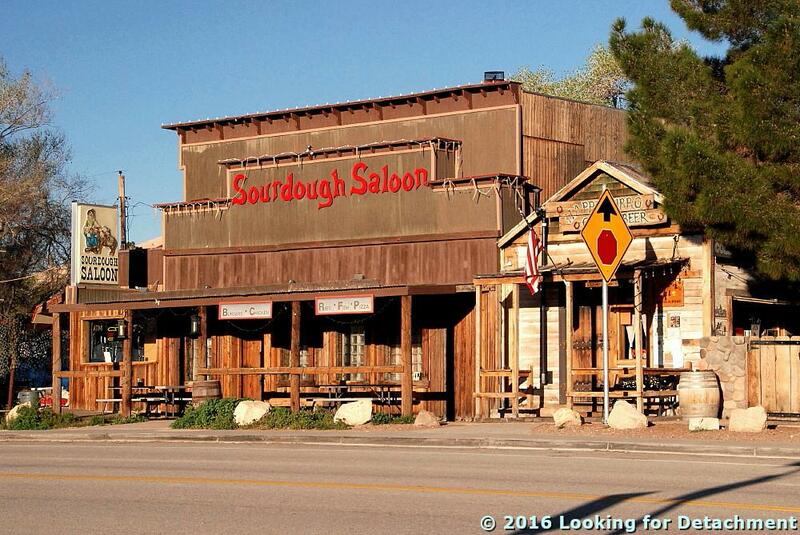 Unfortunately, I can't say that I recommend eating at the Sourdough (although I've since read that you can get a good pizza at the bar, something we didn't try). There seems to be no method for getting your order in other than finally realizing that you are supposed to go up to the kitchen window and harass the cook; the food takes nearly forever; and the sole person present does all the cooking, table waiting, and table cleaning—and she isn't shy about letting you know how put-upon she feels about that! Besides, my memory says that the beer was fairly standard. (I'd rate a bar average or standard if either Sierra Nevada Pale Ale or Blue Moon Belgian White were the best beer available—or if zero IPAs were offered—although the presence of either beer, bottled or on tap, would mean that the selection was better than what is typical of old-style Nevada bars, where Coors or Bud are standard and MGD, Killian's Red, or Heineken might be the best beers available). We relaxed with our ales and enjoyed ourselves as much as possible but didn't go back the next night (or rather we did, but we stayed only a minute or two—long enough to figure out it would be the same slow and dramatized scene as the night before). 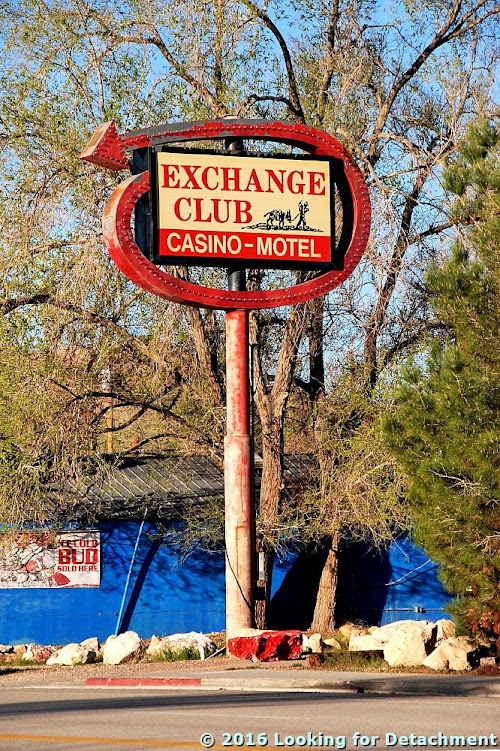 The Exchange Club casino and restaurant, closed since 2004. Old sign for the Exchange Club near the center of town. I took two pictures of the innacurate sign (I repeat: there is no casino). 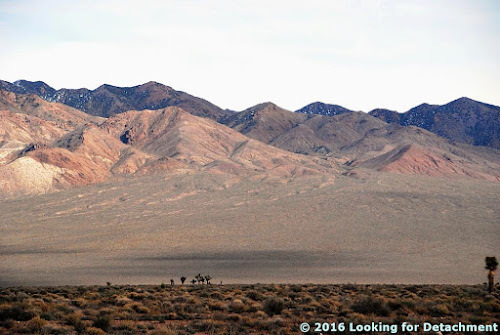 On this particular morning, the third day of our rambling journey undertaken primarily to see the superbloom in Death Valley, I puzzled over a fold up in the hills just southeast of town. At first I was wondering what a fold like that would be doing in the Miocene volcanic formations that surround the city. I later realized this possible recumbent fold was in older rocks—Paleozoic or even Precambrian. Looking at Google Earth and the geologic map of the area (Monsen et al, 1990), there's definitely some folding on that hill, but I'm not sure of its geometry. The rocks are mapped as the Late Proterozoic (formerly Precambrian Z) lower member of the Wood Canyon Formation: quartzite, siltstone, dolomite, and limestone. After breakfast and a fuel stop, we left Beatty's main intersection by going straight instead of turning left. U.S. Highway 95 turns left toward Las Vegas; MOH and I went straight. Our trip into Titus Canyon begins here! On this leg, we will finally make it into Beatty! Yay!! In our last episode we were at Black Rock (it should be Black Rock Point, or something, but isn't) checking out Lone Mountain and the Boss Mine. 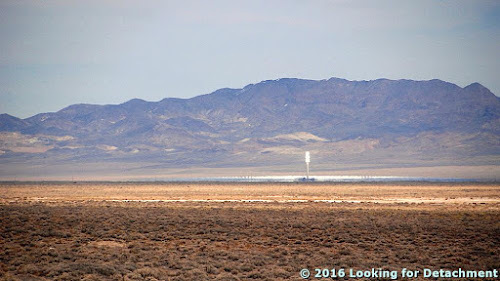 Before leaving, I managed—with my handy-dandy, relatively new Nikon DSLR with 18-300 mm zoom—to get this shot of the far-away Crescent Dunes solar thermal power plant, which reportedly went online in February. The power tower and mirrors of Crescent Dune in front of the San Antonio Mountains. Part of the defunct Hall moly mine can be seen on the far left. 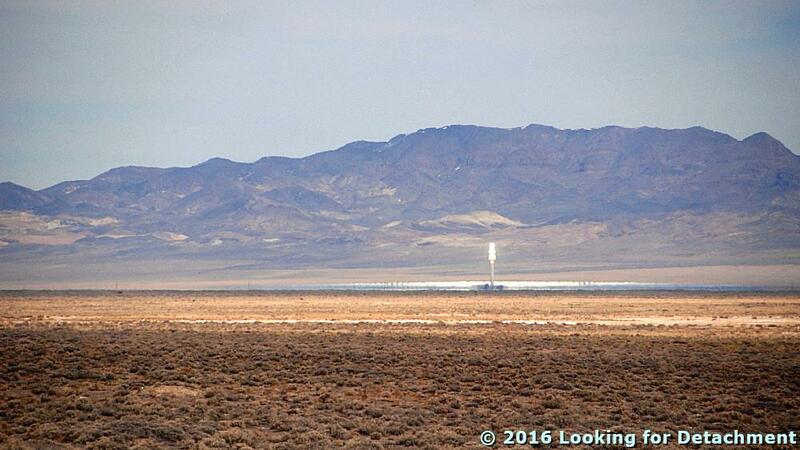 The tower is about 18.5 miles distant in this photo. And then we got back in the Jeep and proceeded down the road toward Tonopah, where we had some coffee and a snack, and went on our way—again. 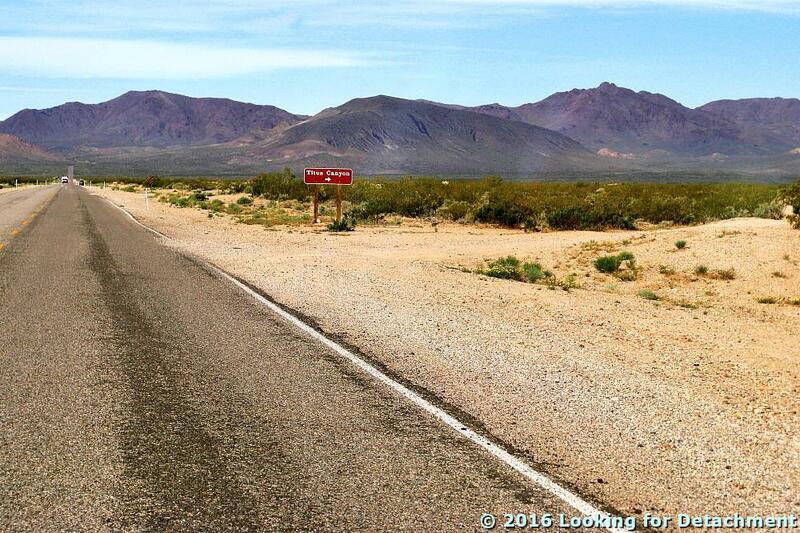 As we drifted south from Tonopah, side roads tried to distract us from our goal of reaching Beatty that night. So much to see! So many possibilities! 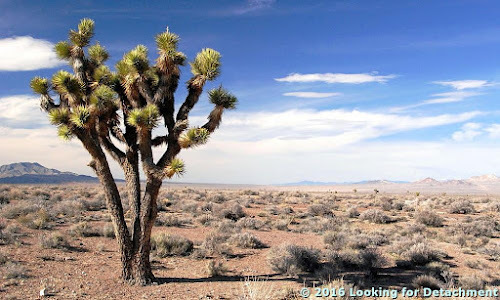 We resisted being drawn astray (resistance is sometimes but not always futile), but upon spotting the first batch of Joshua trees just north of Goldfied, we gave in and pulled over to take a look. It turns out that we pulled over only to take photos of a tree I had photographed in 2010 and posted about here. Relatively close view of the large-ish Joshua tree we stopped for. This particular tree is not far from Highway 95 and is just a skip and a jump down the Silver Peak Road. 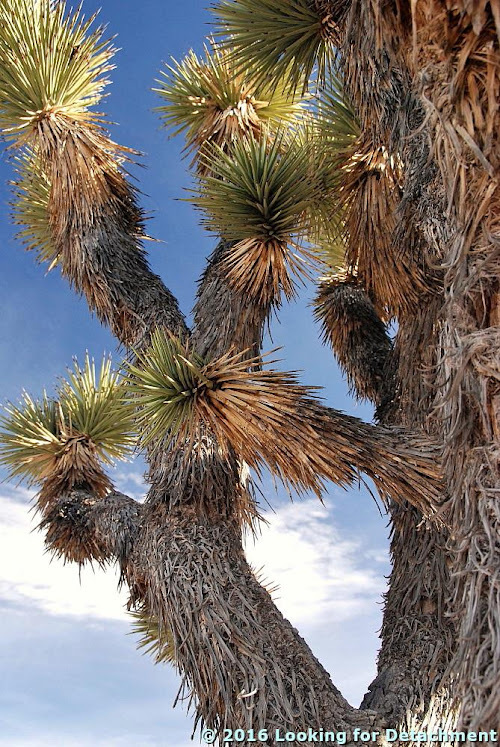 It might, therefore, be one of the more photographed Joshua trees in Nevada. 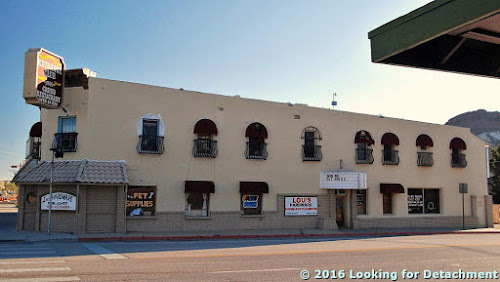 Here it is on Google Street View. 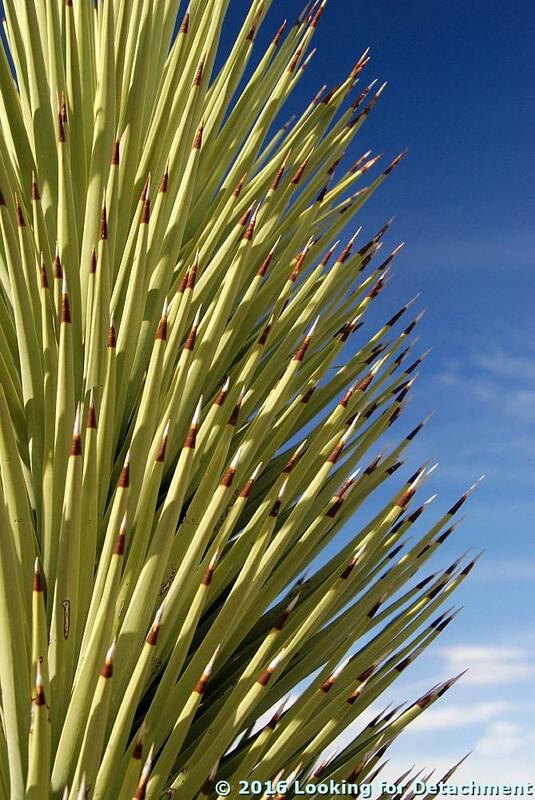 We were unclear about a few non-branching types of yucca (next two photos), but I think this is probably a young Joshua tree. 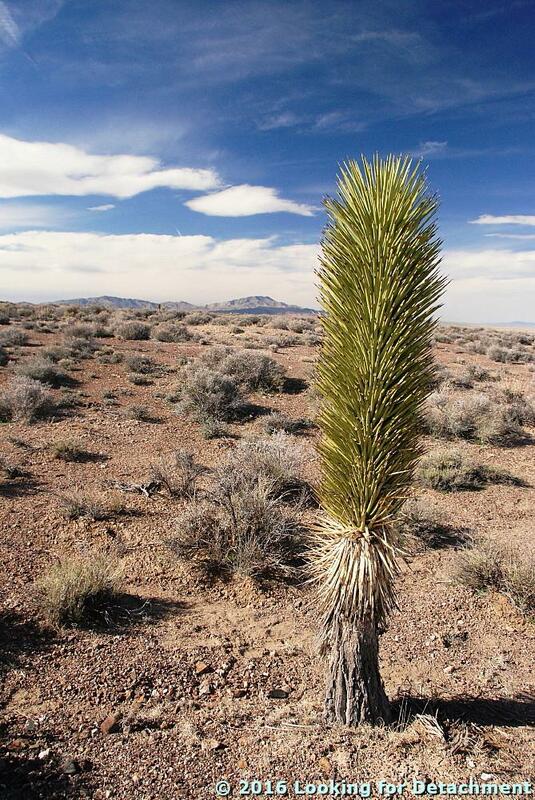 Unbranched yucca with Lone Mountain on the horizon. A closer view of the leaves of the non-branched tree. 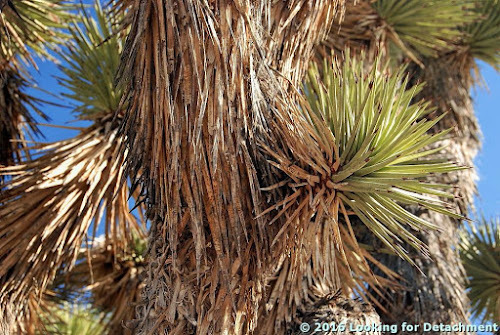 The entirety of the Joshua tree from the first two photos. Lone Mountain is on the left (NW); the hill going into Tonopah is over there on the right (N). 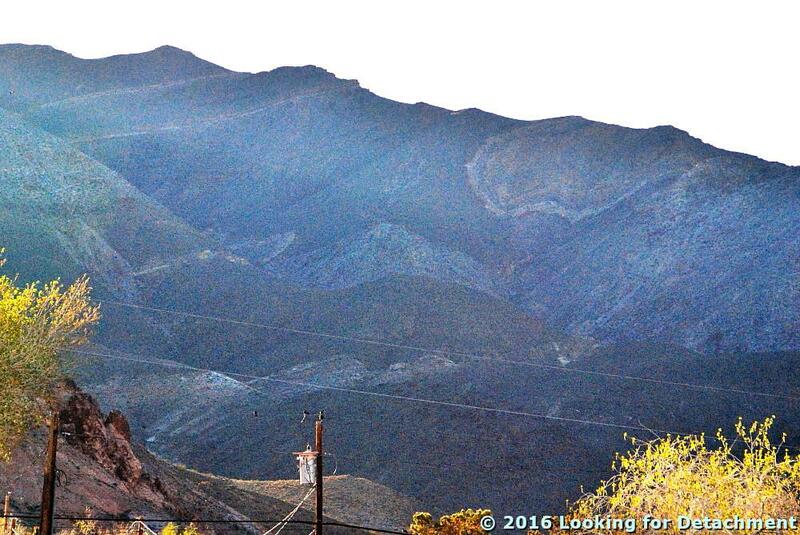 I just noticed the snow-capped range beyond Hasbrouk Peak and the other hills near Tonopah. This is the high part of the Toiyabe Range, including Toiyabe Dome (11,361 ft, 3463 m) and possibly Arc Dome (11,773 ft, 3588 m), which is the highest point in the Toiyabes. 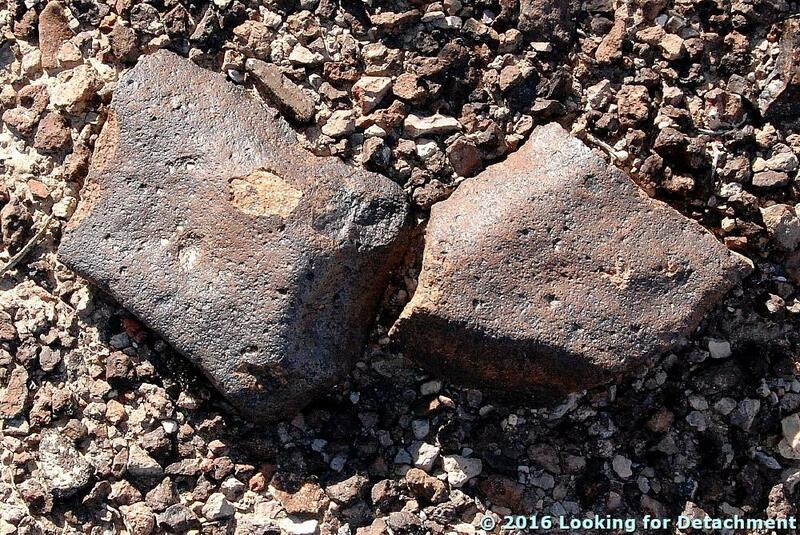 The varnished rocks are probably probably volcanic. More Joshua trees against the backdrop of the volcanic mesas to the west. We got back on U.S. 95 and headed south, passing through Goldfield, and pulling off the highway just one more time just north of Lida Junction. 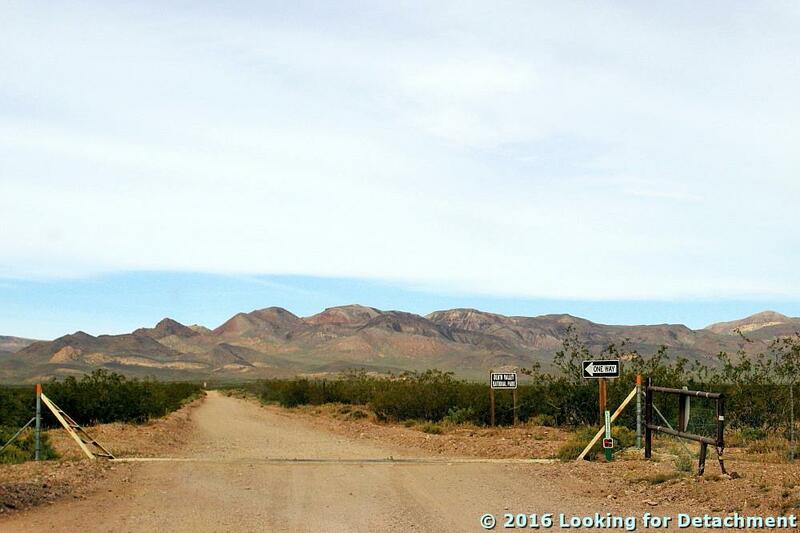 I looked down a dirt road I'll probably never travel, a road leading mostly into the unexplored Nellis area. 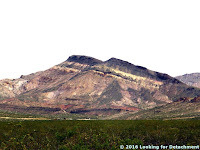 Stonewall Mountain is partly in and partly outside Nellis, so it's possible I'll get up to the west side someday, to look at those brightly colored volcanic rocks. 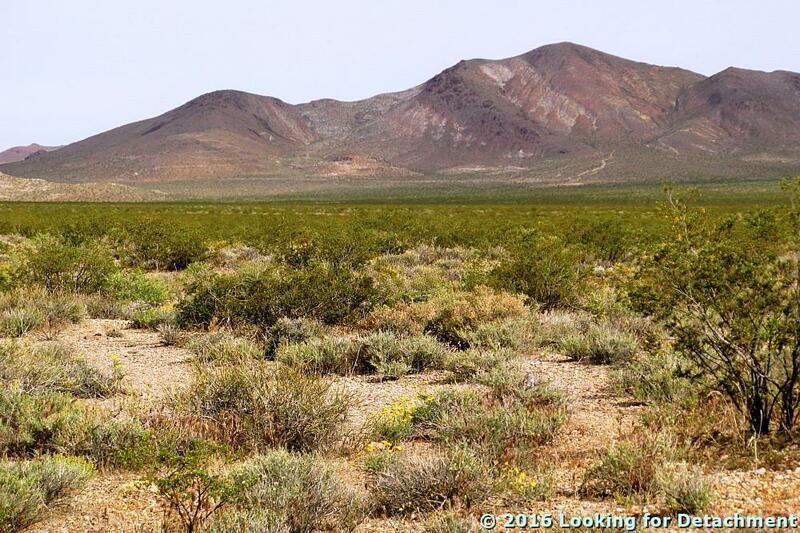 Sunlit alluvial fan rills, shadows on the colorful mountains, and Joshua trees. We were ensconced in our Beatty motel room by 4:45 pm. We didn't waste any time before going out to find some food. The recent drop off in "geology," which began in 1980 or 1981, no doubt resulted in part from the changes at many colleges and universities in department names from departments or schools of Geology to departments or schools of Geosciences, Earth Sciences, Earth and Planetary Sciences, Earth and Environmental Sciences, and others. Andrew Alden has a bit more to say about "geology" v. "Earth science" v. "geoscience" here. "Subduction" v. "plate tectonics" v. "continental drift" v. "geosyncline." There's an interesting little blip in "subduction" from 1953 to 1959; not sure if this relates to anything real in the history of plate tectonics or is related to something else. Surely "subduction" prior to 1900 is unrelated.